Jim Eddy is a remarkable furniture maker and a remarkable man. He is deeply knowledgeable about the history, form, details and the wood species, the many variables/behavioral characteristics of wood, milling, finishes etc. Jim was instrumental for making design decisions. He dedicated an enormous amount of his time to talk with me about the many details. He worked extremely efficiently, and completed my tables on time, under a very pressured deadline. He managed to do this despite delays that I myself caused when I asked him to pause the process, a couple of times, while we evaluated options for details and finishes. Jim produced samples, mailed them, and kept me up-to-date about all the issues. Always very accessible and thoughtful. The result is a remarkable table, a transformation of the Shaker drop leaf type. The finish and details are stunning. Everyone I have shown it to has found it to be beautiful. I intend to work with Jim again on future furniture projects. He is a rare, extraordinary, genuine artist. 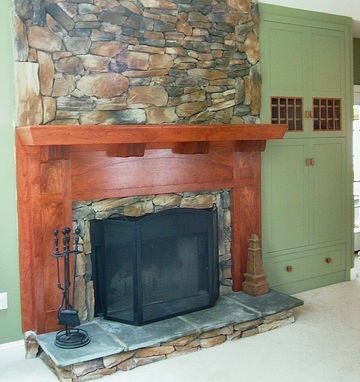 This mantel was designed to harmonize with the style and color of the clients existing arts & crafts furniture. The laminated corbels support an oversize mantel shelf. The built-in cabinet to the right houses children's toys and the stereo components, remote controlled through the multi-paned smoked glass. Every maker has a story. Be a part of James Eddy Woodworks's story by placing an order, leaving a review, and seeing your review appear here.